British Researchers Created A Novel Water Quality Sampling Technique Using What Common Item? Which Sci-Fi Author Has Had The Most Profitable Film Adaptations? When English professor David Lerner was looking for a cheap and simple way for anyone (not just colleagues of his armed with expensive equipment) to test water quality, he stumbled on a brilliant and practically foolproof method that a layman could deploy. Professor Lerner’s area of concern is with the contamination of rainwater sewers (and by proxy the water sources they dump into) with gray water waste from homes and businesses. The terms white, gray, and black water are used to refer to degrees of contamination. White water is the water pumped to your home by the city or from your well. Black water is water that has come in contact with human waste and should be removed via sewage systems or drained into a septic tank. Gray water is the term used to refer to everything in between: water from your shower, dishwasher, washing machine, and so on. Lerner found that the techniques he had been using were expensive, required advanced and calibrated equipment, and didn’t necessarily provide consistent or accurate results. In light of this, he focused on a simple premise. Laundry detergent would inevitably be present in the majority of gray water systems that were illegally draining into storm drains and waterways and almost every laundry detergent on the market contains compounds known as optical brighteners: fluorescent chemicals that attach to clothing fibers to absorb UV light and re-emit it as a blue-white light. These chemicals make your whites appear very bright while simultaneously masking the yellowing of white fabrics. You’ll never find the compounds in optical brighteners in nature, so when you do find them you know they’re the result of human contamination. How to find them easily? With tampons. 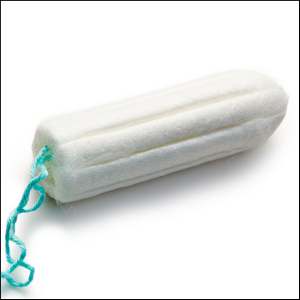 Tampons are pure cotton, packaged in a sterile environment, and optical brighteners bind with cotton. Dip a tampon in a river, leave it for a few days, fish it back out, and shine a black light on it and the optical brighteners, if present, fluoresce strongly. The process is inexpensive, easy to use, and capable of detecting optical brighteners at extremely low concentrations.